Thankfully, this remake of the Tamil original Singam (2010) is loud and playful in its violence, that the grimness and coarseness of the act doesn't come through, as it did in, Anil Sharma's Gadar: Ek Prem Katha (2001) and similar 'body count' movies. Neither does it have the little spark (beneath the redundancy) that Anubhav Kashyap's Dabangg (2010) had. You have seen it all before, the good cop, bad man act. 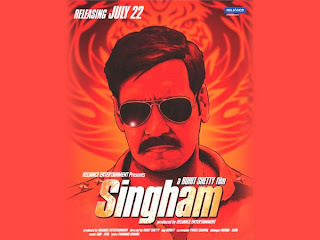 In true Hindi film and South Indian 'hero is god' mode, Bajirao Singham (Ajay Devgn, good act) is a no-nonsense, ferocious police inspector of a village in the outskirts of the director's favourite setting - Goa. His nemesis is the corrupt, aspiring politician, Jaikanth Shikre (Prakash Raj, superb in the exaggerated tone of the film), with whom our hero has a series of face-offs that forms the bulk of the movie. The heroine (Kajal Agarwal) is more about filling the mandatory formula, than to do anything with the story. So fantastic and comic-book style are the film's elements that Rohit Shetty could have well made a good cop spoof movie out of it. All it needed was little tweaks in the screenplay. Alas, such is not the case, and we are full of laughs - both intentional and otherwise. Much of the film's flair comes from the Singham-Shikre confrontations, mostly devoid of action, instead packed with engaging, over-the-top dialogue. Raj gets some quaint, crazy lines, which he pulls off superbly well, a mercurial performance. The action has Shetty's four-wheeler fetish coming up again, more of them are crashed and banged in style. The bare-handed punches are tried, tired territory, Devgn's newly acquired six-pack body only adds to the fantasy of sending scoundrels flying, twisting and sliding all over and across the screen. The soundtrack and background score (Umpteen Lion roars) add nothing to the movie, and finally, in totality, Singham is familiar Hindi violent-film zone that is enjoyable in the hero-villain interplay, its performances and its light comic scenes. Bearable, we say. If you are the mass audience, this is for you. Cinema lovers - Your call. Shikre does a Rajnikanth imitation before a group of policemen.